Yesterday was my first day blogging and I already noticed a mistake. I said “my 5 kids don’t laugh”-of course what I meant was “my 5 kids: don’t laugh”! They always joke that I don’t know a thing about anything,especially anything related to the computer….any one else have teens and twenty year olds???? Today, I would love to start sharing with you chairs that have been saved by reupholstering them. The chairs you will see the next few days were also, as was my yellow stool, headed for the dump. Instead they were given a new life and used in places where the client thought of buying a new chair. Older furniture almost always is better than new -better made and sturdier than new. This first one was given to the client by her Mom who was selling their beach house. I don’t even remember what it looked like before, but I do know that as it was in the upholstery shop window (after being finished) and he said he could have sold it at least 5 times! 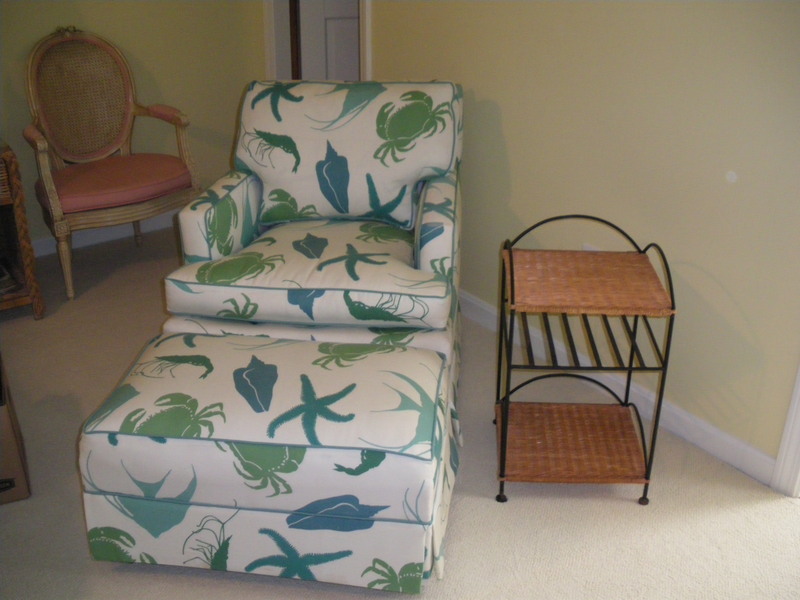 This entry was posted in fabrics, reupholstery, summer/beach houses and tagged Chair, Furniture, Home & Garden, Seating. Bookmark the permalink. ← Happy first blog day! That fabric is great. Who makes it? I love that fabulous fabric on that shell chair. That is just the type of material/chair I would like for my house at the Cape. and it is a “sunbrella” fabric so great with mold,mildew etc…there are many out there! !